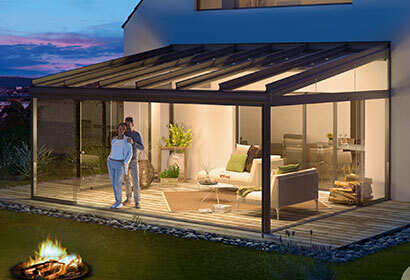 With Winter fast approaching, here at UK Glassrooms we have compiled a short list of accessories for your awning, veranda or glassroom which can help you to make the most of your system throughout the difficult weather, enabling you to continue comfortably enjoying your outside space. One of the most useful accessories in general is a wind, sun and rain sensor for awnings, available from Samson. It not only makes your system more convenient for use, but also has some important improvements on system safety, ensuring there are far less chance of adverse weather damaging the awning. 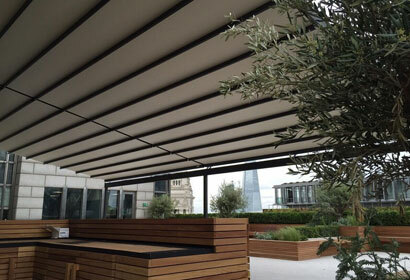 Awnings can be combined with glassrooms to create the ultimate British weather solution, and with a wind, sun and rain sensor, these can be automated. 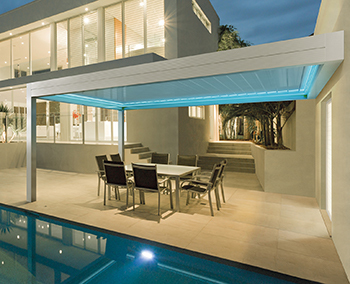 Extending when the sense sun or rain, and yet retracting if an overglass awning when it senses too much wind. This is a perfect addition for people with busy lives, who need an awning that can take care of itself. Thw ability to retract in high wind meabs there is also a much smaller chance of the awning being damaged. Infrared Heaters such as Weinor's Tempura system are another fantastic choice. These heaters not only provide instant heat, but also conserve energy. When compared with standard heaters, infrared heaters can save up to 30% on energy costs, and this makes it a fantastic addition for winter, when heating solutions are used more frequently due to the cold temperature. Another benefit is that they require almost no warm up time, and this means instant heat is transmitted. This is in part due to the way infrared technology works, where rather than warming the air, the heatwaves travel straight through to solid surfaces. LED lighting is another important addition. As the nights get loner, and the days themselves get a little more dull, bright and energy conserving lighting is an important concern. LED lighting is the best way to do this. With their uses inside houses, vehicles and public spaces all expanding, LED lights are becoming popular for exactly these properties, as companies and businesses look for money conserving lighting sources without compromising visibility or safety. Alongside this, LED lighting is very adaptable. Gibus, for instance, offer multiple different forms of LED lighting. LED Spots are available, consisting of spotlights enclosed an anodised aluminium casing and a stainless steel bracket. They also do LED bar lights of 12 LEDs, available in 100cm, 200cm and 300cm lengths. Alternatively, RGB LED strip lighting is also available, and allow any RGB colour to be chosen and switched between at the touch of a button. Retractable blinds are another consideration. Some systems such as the Gibus Med Varia some with blinds inbuilt, whilst some stand alone systems such as the Weinor Paravento can also be purchased. 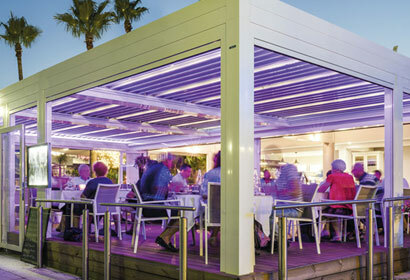 These systems are easy to operate and provide wind and rain protection from the sides, as well as a level of privacy.